For some time now, Pakistani traders have been talking about the trade imbalance with China. Pakistan has developing industrial potential but it can't match China. However, in November this year, an opportunity is coming that might shift the balance of trade into a more mutually beneficial situation. China has come up with a novel plan for encouraging imports from its trading partners - the China International Import Expo (CIIE). The expo, which will be held from November 5 to 10, offers a chance for global manufacturers and producers to showcase their products in order to gain access to China's market. The expo is also an opening for countries participating in the Belt and Road (B&R) initiative to boost their infrastructure upgrading and reach wider markets. Pakistan is one such country, which is undergoing massive infrastructure development to align itself with global transportation and communication networks. The China-Pakistan Economic Corridor (CPEC) will create an advanced network of roads, railways and a deep-sea port that will boost trade with China, Central Asia and Europe. The Chinese government has granted the status of "Guest of Honor" to Pakistan at the CIIE. This will ensure the provision of all possible facilities and benefits to the Pakistani pavilion. The gesture also shows the level of commitment in China to make Pakistan part of a shared future. China is the world's biggest consumer market. Chinese consumers' per capita disposable income surged by 7.3 percent year-on-year in 2017 to 25,974 yuan ($4,100). Demand for imported food has been growing steadily, creating a market worth $58.28 billion last year, a 25 percent increase year-on-year. Pakistan, on the other hand, has a largely agrarian economy. With the help of Chinese scientists, local agriculture specialists have successfully introduced modern farming techniques. Hybrid rice and hybrid wheat have been the most successful products, seeing a marked increase in yield. Meanwhile, Pakistani mangoes are also doing well; 10,000 tons of them are expected to be exported to China by the end of this year. To take advantage of China's food market, Pakistani producers at the CIIE can offer their own unique and cost-effective products. A bigger share of the market in China would translate into higher revenues, improved quality and a wider product range. Apart from food, there are other Pakistani products with immense potential for export to China, including onyx stones, minerals and surgical items. The expo organizers were initially expecting around 150,000 purchasing agents, but they have so far registered over 160,000. This massive participation will present Pakistan with access to markets in other countries as well. As foreign buyers experience the previously unexplored Pakistani prospects, new windows of trade will open. Thus, Pakistani businesses will expand not just into China, but also internationally. Starting from the port of Shanghai, China is rolling out assistance for B&R countries to bring down their trade costs. The cargo clearance process has been simplified and a new filing mechanism is being built for the CIIE pavilions of these countries. China is also adjusting tariffs on certain products, such as nuts from Pakistan, in order to meet the demand among domestic consumers. As a follow-up step to the import expo, Pakistani manufacturers can take advantage of China's booming e-commerce sector. They can utilize this highly developed industry to reach out to more customers than would be possible only with physical stores in China. Alibaba Group has acquired Pakistan's largest e-commerce portal and its payment arm Alipay is planning to enter the Pakistani market this year. These ventures will help local manufacturers export goods to China while letting the supply chain infrastructure, which is already maturing under the CPEC and B&R initiative, do its job. Pakistan and China are developing stronger ties in the rapidly evolving global order. Their geopolitical interests are aligned more than ever and bilateral trade has increased significantly since the CPEC was initiated. In this situation, people-to-people interaction is extremely important, as it enables them to understand each other's trade practices. 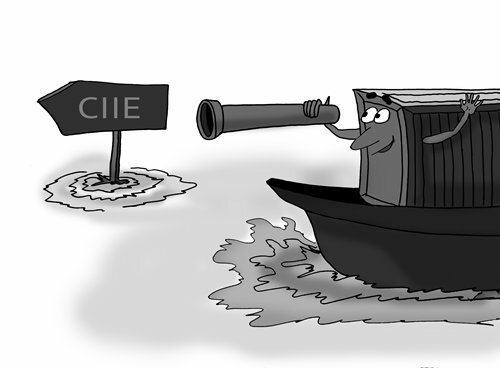 The CIIE is a sign of China's trade liberalization. It is proof that China is willing to open its markets to the world and offer equal opportunities. With protectionist waves coming from the West, China is standing steadfast in upholding multilateral practices for trade and globalization. If the new economic order recognizes this, a collectively profitable future can be achieved.